In the last years, the capability, talent and understanding shown by our nation, proved that those who have bad opinions about our nation were imperceptive and in grave error. Our nation with its capability, characteristics and in addition with a new name of its government will be successful in showing itself in the civilized world. 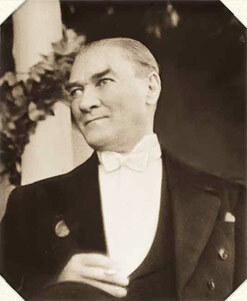 The Turkish Republic will prove its right to occupy its place by its achievements. Do not ever think that coming generations will be surprised by seeing the so-called republicans among those who mercilessly attacked the Republic on its proclamation day. On the contrary, Turkey’s intellectual and republican youth won’t hesitate in analyzing and determining so-called republicans’ real ideas. They will easily understand that: if one exists whose title is caliph, and governs the rotten dynasty and never minds to get away from the administration, then it does not matter whether the Republic is proclaimed or not, because it is impossible continue its survival in such a situation. The formation and protection of sustainable freedom, equality and justice in society depends totally on the exact sense of establishment of national sovereignty. Therefore, the basis of freedom, equality and justice is national sovereignty. Freedom in our society and in our state is limitless. Its borders are present and defined by the protection of the principle that makes it limitless. An individual may willingly want to dispose of his freedom, but if this attempt will harm the life and freedom of a nation, if the life of a nation full of greatness and honor will fade because of this and if the children and grandchildren of that nation will disappear because of this, such attempts can never be reasonable and acceptable. Furthermore, such an action can never be tolerated in the name of freedom. Friends! There is no-one expecting a crown and there is no dictator in the Turkish state and among the people of Turkey that have established the Turkish state. There is no one after the crown and there will never be. Because it is not possible. Those involved in the destiny of a nation should never forget the fact that they are to use the power and dignity of that nation only to obtain the real and sustainable benefits of the nation itself. These men should always remember that it is not enough to invade and restrain a country to be dominant over the owners of that country. It is not possible to be dominant over a nation unless the spirit of that nation is bound and its determination and will are broken. No force can resist the national spirit nurtured throughout centuries. The Great National Assembly is the summary and the symbol of the Turkish Nation’s understanding of self rule and the its search that took centuries. The Turkish nation has been able to disperse the darkness and look at the future with hope after it has handed its destiny over to the capable and patriotic hands of the Great National Assembly. People should always aspire to high, pure and sacred goals. Only thus is it possible to satisfy the conscience, the mind and the whole human being for those who call themselves humans. Those who walk in this path will achieve higher ranks to the degree they are devoted; and this way of life will be definitely apparent. The main principle, accepted by civilized states that are ruled according to the principles of national sovereignty and that is still valid is the principle that the political group, which represents the general demands of the majority and which is capable of taking necessary steps to fulfill the requirements of those demands within its power and capacity, is charged with the administration of the state and gives this esteemed responsibility to its supreme leader. As a matter of fact, a government that doesn’t fulfill these requirements is not able to rule in any way. To form a government out of powerful, but nevertheless second grade group members and attempt to run it by way of the directives and advice of the first grade leaders of the party is certainly not correct. The tragic results of such a practice could be witnessed especially in the last days of the Ottoman State. Are there not too many harmful effects to count, which the nation had to endure because of the sadrazams (grand vizier) and their governments, who were mere puppets in the hands of Union and Progress leaders? It can never be the case that a party, which is in the leading position in the Assembly leaves its right to form a government to the opponent party that is in a minority state. Begging for pity and mercy is neither the way to run public works or administer the state, nor the way to ensure honor or independence of the nation and state. I’m a man, who wants to see his thoughts embedded in the demands, needs and will power of his nation. This is indispensable to me; only if I have realized this, I feel the responsibility to implement my ideas. To be able to pass from the sultanate era to the republic era we have lived a transition period, as you all know. In this period two ideas and visions struggled with each other. One of those ideas is the continuation of the sultanate era. The supporters of this idea were clear. The other idea is to bring sultanate administration to an end and to set up the republican administration. The second one was our idea. We saw objections to declaring our opinion clearly. We had to overcome the ideas of the supporters of sultanate administration before we declared our ideas, to find the right time to realise our aim. As the new laws were realised, especially when the constitution was realised the sultanate partisans insisted the indication of rights and authorities of the caliph. We agreed that it was not the appropriate time for this. We intended to shape the government administration in the context of national sovereignty as a basis, without mentioning the republic. We insisted that there is no higher authority than The Grand National Assembly. And we were trying to prove it is possible to administrate the country without the sultanate and caliph positions. We did not say a word about the duties of president and the president of the Assembly carried out the duties de facto. Actually the president of the Assembly was the second president. There was a government. But it was born by “The Grand National Assembly” . we avoided to pass to the cabinet system. Because the sultanate partisans immediately would have suggested to use the sultan’s authority. We are stronger than before. We have bigger capability and are fitter to live in comparison with the past. What brought about this superiority? The real reasons lie hidden in the foundation on two principles. One of these principles is Misakı Milli ( National Oath ), the second one is our constitution that our nation holds in her hands unhindered and unconditionally. The Grand National Assembly has gathered under difficult conditions. And The Assembly determined the state’s and the nation’s condition and characteristic, verified its absolute resolutions with constitution and laid the foundation of the Republic of Turkey by accepting the 1st November 1922 resolution.